In this second part of our three part series on Towing Vehicles and weights, Keith Thompson, our roving FRC Ambassador explores a series of the most common utes on the market, which are used to tow caravans and fifth wheelers. So you have selected your caravan, now you want to know the best Ute available to tow it? Whilst manufacturers will all give you vehicle ratings, we have discovered that there can often be some considerable but varied discrepancies between the rating and what you can actually tow or carry. In the Utes, if you want to load the vehicle to its fullest then the only ones that can pull 3500Kg is the Landcruiser 70 Series, and the Nissan Navara which can still tow 3500Kg when fully loaded. Having said that “fully loaded” for the Navara is still a respectable 560Kg (564M/558A) but with a limited 300Kg tow ball loading. Bear in mind though that this 560Kg (as with all) includes the weight of everything not factory standard which includes bull bar and lights, towbar, roof racks, internal drawers, fridge slide, fridge, canopy and all the other “stuff” that we all cart around, especially those of us who live on the road full time. Don’t forget the weight of yourself/selves plus the dog! (And the tinny or Kayak(s) on the top). This is the only way the Utes make up for the difference with the Wagons which have payloads often about half that of the Ute. The following summarised chart shows all the common models; in each case we have picked a mid to top end model which seem to be the most popular. As well as the most common models we have also added the Mercedes (Nissan based); the Iveco 4WD, which competes on price with the Landcruiser 70 Dual Cab; and the new LDV Dual Cab which has some impressive specs for its price, apart from being a little under powered. Before you refer to the chart, here are some figures to help in Calculating Your Load: The best approach is of course to weigh everything but we provide a guide here to what many commonly added items may weigh. *Iveco 2 Wheel Drive Model has a V8 option. **Nissan specify that for a towball loading of 300Kg the total Payload be reduced by 410Kg,(not just the 300Kg of the ball weight) similarly for a towball loading of 200Kg the payload has to be reduced by 280Kg. We have made a theoretical change to GVM to more easily show the figures for 300Kg towball weight. Obviously towing at 0Kg ball weight is impractical, and in fact dangerous, so we have left the figures blank for that. All baseline figures used in the above charts are from Manufacturers published specifications at May 2018. The GCM of the Ranger is 6000Kg so with the fully loaded van at 3500Kg that leaves a gross weight of 2500Kg for the Ranger after towball weight (which is already included when you weigh the whole rig together). As the Ranger Wildtrak has a Kerb weight of 2250Kg there is only 250Kg to cover the extras like bullbar, towbar, fridge, tools etc. ; plus Driver and Passenger! Therefore the safe limit is somewhere between the 3150Kg in our chart and a little higher if the Ranger is not fully loaded. Interesting to note here is that if you “downgrade” to the bare bones XLT 3.2L Model the Kerb weight is so much lower you gain 193Kg in payload; these are the “weight costs” of a more luxury model. No doubt this may apply to other manufacturers as well but we have not explored all the options. Our calculations above allow only for the maximum towball weight as shown, some 3500Kg ATM vans have towball weights around 280Kg which will give the tow vehicle another 70Kg. 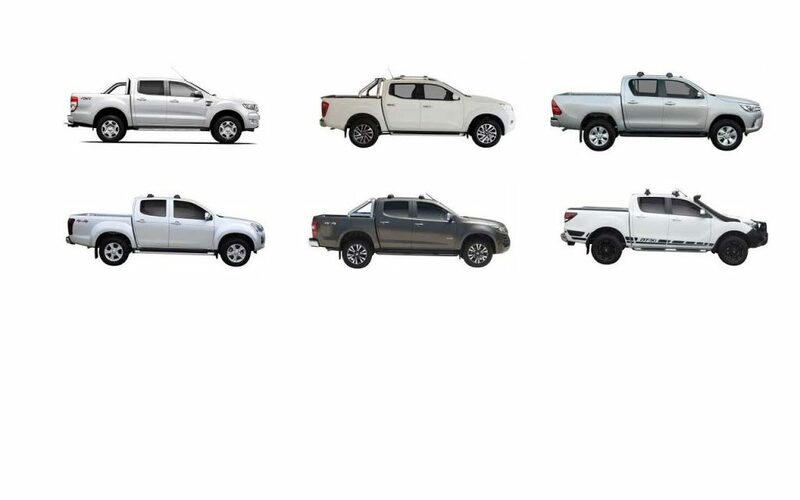 With so many great looking Utes out there in the market place, it is important to not get carried away on looks and price and make sure that you select the right one that is going to do the job for you. The example given above is only one case, and in each and every case you should take into consideration your own van and weights. In Part 3 we will look at the common 4WD Wagons and their specifications and real capacities…….